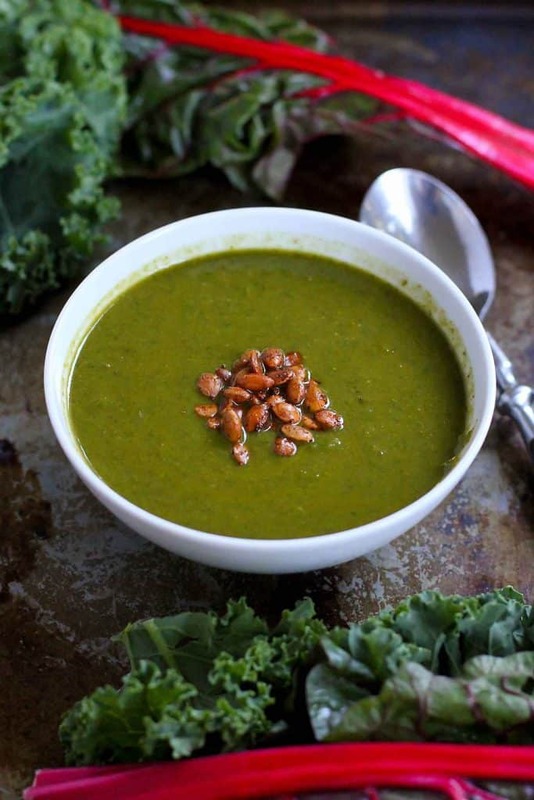 This Blended Super Greens Soup is filling and healthy, and is made even more delicious with a sprinkle of spiced pepitas. The ingredients list for this super green soup is like a walk through the leafy section of the supermarket produce department. 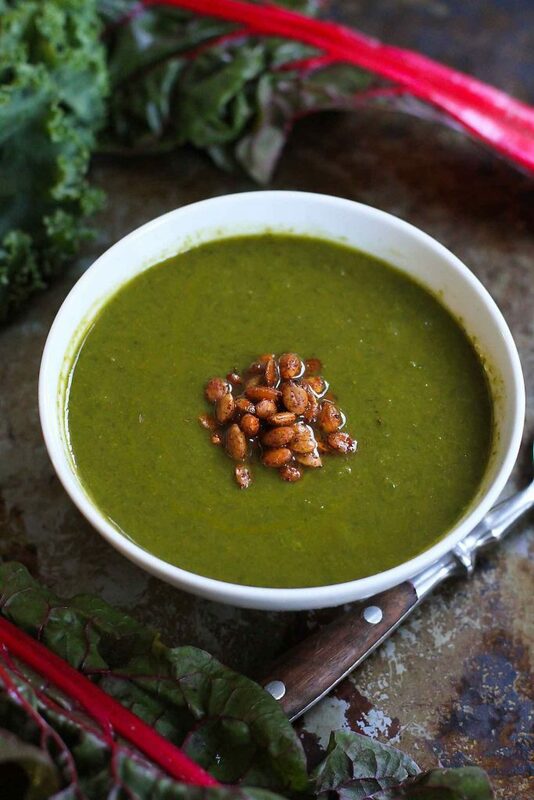 Kale, Swiss chard, spinach…it’s all here and blended together into this hearty soup. But don’t forget those spiced pepitas because they just might be the star of the show. Considering that half of the pepitas mysteriously disappeared from the baking sheet before the soup was served (ahem, sneaky little hands), I would say that my boys agree. Blend together the cooked vegetables and herbs or spices with some broth, as seen in this bell pepper soup. Add cooked beans (Great Northern beans in the case of this super greens soup) to the mixture, then blend. Add cooked rice to the mixture, then blend. Make a roux, using a little oil or butter and flour, then add milk, as I did with this turkey chowder. 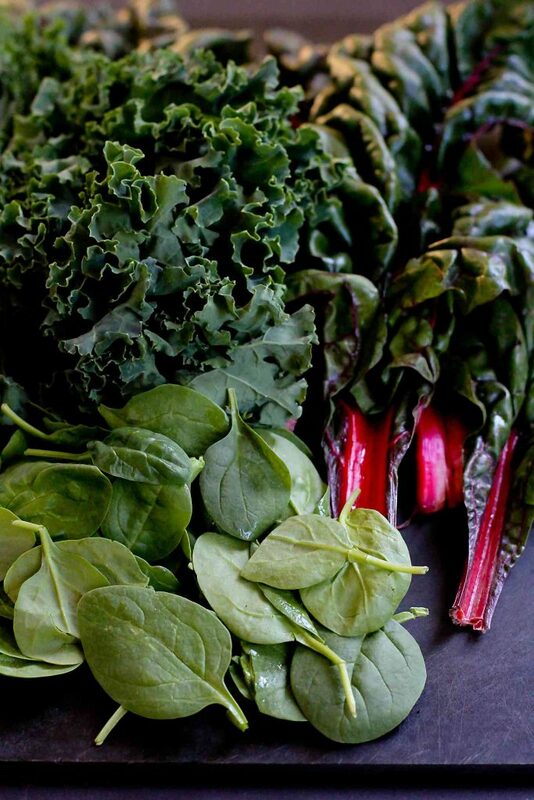 Packing the soup full of super greens means that it’s full of vitamins and minerals. And let me point out that there are also 14 grams of fiber and 17 grams of protein in one serving, so it will easily hold you over to your next meal. Heat the olive oil in a large saucepan set over medium heat. Add the onions and cook, stirring occasionally, until the onions are softened, about 5 minutes. Stir in the cumin, paprika, salt and pepper, and cook for 1 minute. Squeeze the roasted garlic cloves into a small bowl, add ½ cup of the broth and smash with the back of a fork. Stir the roasted garlic and broth mixture, along with the red wine vinegar, into the onions. Add the remaining 3 ½ cups of broth, beans, Swiss card and kale to the saucepan. 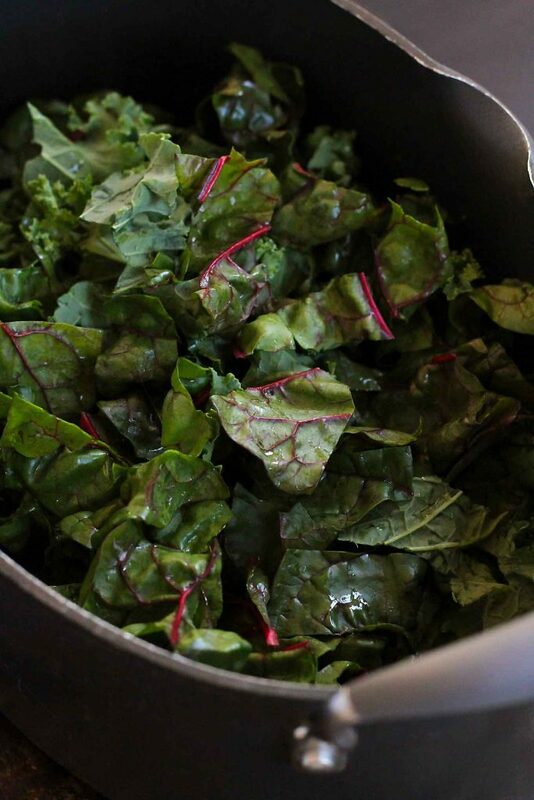 Bring the a boil, reduce the heat to a simmer, cover and cook until the greens are tender, 4 to 5 minutes. Let the mixture cool for about 10 minutes. Use a handheld immersion blender to puree the soup until smooth. Alternatively, puree the soup in a blender in batches, taking care to release the steam periodically and holding down the top while the blender is running. Stir in the nutmeg and cayenne pepper. Season to taste with salt and pepper. Serve with the spiced pepitas sprinkled on top. In a small bowl, toss together the pepitas, olive oil, paprika, cumin and salt. Spread the coated pepitas on a baking sheet. Bake until the pepitas are golden brown, about 5 minutes, stirring once. Watch carefully so the pepitas do not burn. This soup sounds yummy, but I do have a question about the garlic, when you say 1 bulb, do you mean one whole head of garlic? I am assuming that’s what you mean, but wanted to be sure. Thanks, and looking forward to making this soup…. Love the beans as the thickener/creamy component! Can’t wait to try this. This is wonderful! I just did a whole post about MOM’s Popped Lotus Seeds. 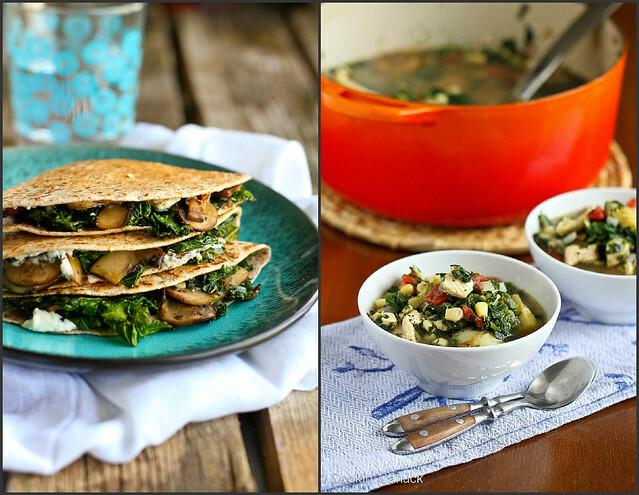 They are a perfect topping for soups and very healthy! Highly recommend checking them out!